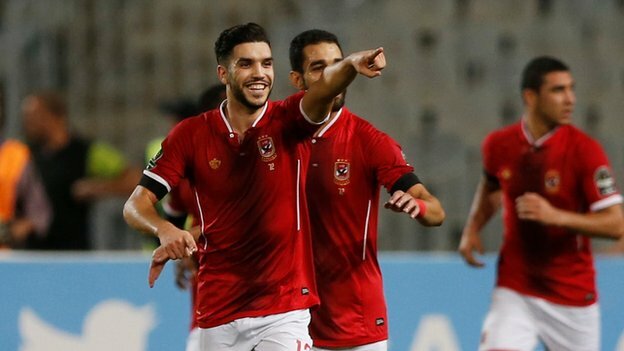 Egyptians Al Ahly will play Moroccans Wydad Casablanca in this year’s African Champions League final after thrashing Etoile du Sahel 6-2 to win through 7-4 on aggregate. In an extraordinary semi-final in Alexandria, Al Ahly constantly ripped the Tunisians’ defence apart as they booked their place in the final for a record eleventh time. After Ali Maaloul opened the scoring for the hosts after just two minutes, Walid Azarou took the game away from Etoile with three unanswered goals. An own goal and a fine strike from Rami Rabiaa took Al Ahly to their first final since 2013, with Etoile replying through Rami El Bedwi and Ihab Msakni late on. Four years ago, Al Ahly beat South Africa’s Orlando Pirates in the final as they successfully defended the title they had won twelve months earlier. Sunday’s game was played in front of around 40,000 fans in Alexandria, which boosted Al Ahly since many matches in Egypt are played behind closed doors for security reasons. Coach Hossam El Badry’s side will meet Wydad in the two-legged final, after the Moroccans beat USM Alger of Algeria 3-1 on Saturday to qualify by the same aggregate scoreline. African champions just once in their history, when beating Sudanese opposition in 1992, Wydad are through to their third final after finishing runners-up to Tunisians Esperance in 2011. Ahly, meanwhile, can now extend their record of eight African crowns to nine should they beat Wydad. Their defeat of Etoile, whose sole African Champions League title remains the 2007 success, maintains their feat of having never gone more than three years this century without reaching the Champions League final. Their previous successes in Africa’s premier club competition came in 1982, 1987, 2001, 2005-2006, 2008 and 2012-2013. The first leg of the final will be played on the weekend of 27-29 October, with the return leg on 3-5 November. Whoever wins will represent Africa in Fifa’s Club World Cup in Japan in December.